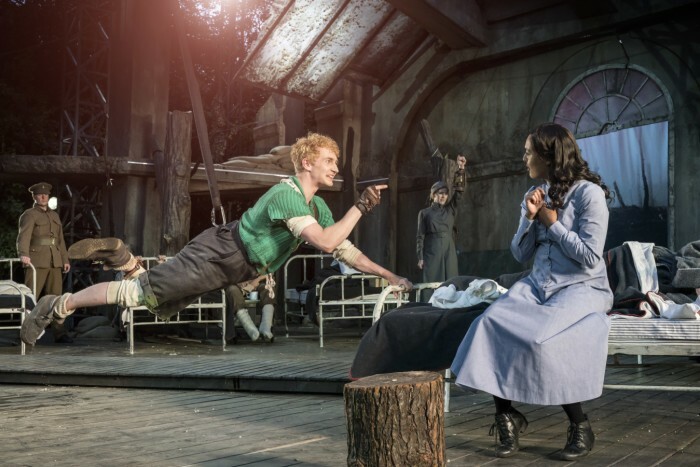 Regent’s Park Open Air Theatre‘s spectacular production of Peter Pan is back at the al fresco venue, and continues to send hearts and minds soaring with its wonderful charm. A revival of the 2015 Olivier Award-nominated production directed by Timothy Sheader and Liam Steel, the show sets the famous tale to the backdrop of the First World War. Here’s why you can’t afford to miss it. JM Barrie’s otherworldly tale of Peter Pan is framed by stark scenes in a military hospital, with young soldiers horrifically injured and traumatised, and nurses struggling to cope. Peter Pan’s explorations of youth, mother-child relationships and fear of growing up are given an extra poignancy by constant visual references to the battlefield, even in colourful Neverland. This production’s Lost Boys, doubling as wounded soldiers back in the ‘real’ world, are tragic victims of an inevitable fate, as well as figures of fun. This isn’t graceful wafting on an invisible wire – harnesses, clips, thick ropes and pulley-systems are all very much on display in this Peter Pan, which gives the flight scenes an athletic feel. This also reminds the audience of the make-believe, ‘child’s playroom’ feel of the production, and its war-time setting (the ropes are operated by uniformed WWI soldiers, who also do much of the scene-shifting). 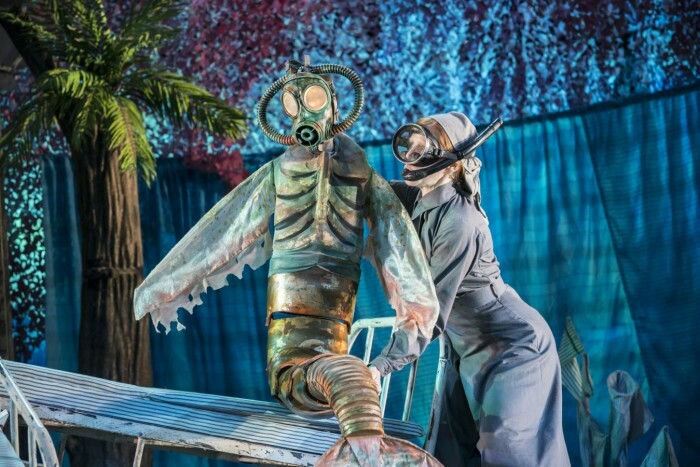 Whether it’s metal hospital beds transforming into poppy fields, mermaids with gas masks, rusty tin sheeting becoming a vibrant ‘Wendy-house’ or Captain Hook’s crocodile nemesis as a mass of cleverly-positioned army paraphernalia propelled by uniformed soldiers, this staging and design is always hugely inventive. It’s often just as entertaining watching the transition between scenes as seeing the final result. There’s a live band hidden somewhere under the stage, but the score is performed so tightly and skilfully that it took me a while to realise it wasn’t pre-recorded. There are some great swashbuckling choruses from the pirates, some WWI marching songs, and the eerie, often wordless singing of a blue-clad female figure, possibly Mrs Darling, a wartime nurse or even a universal mother-figure, who weaves her way in and out of the action – a frequent reminder of the play’s underlying themes. From the Lost Boys and the Darling siblings to Hook’s comically menacing troupe of pirates, the Peter Pan actors cavort about the Regents Park stage with abandon, throwing themselves into sword-fights, chases, jubilant celebration and (of course) flying. Nobody more so than Sam Angell’s eponymous hero, who exudes youthful vitality from every pore. By the end I was exhausted on his behalf – but he clearly has the stamina for it! Book tickets to Peter Pan here!